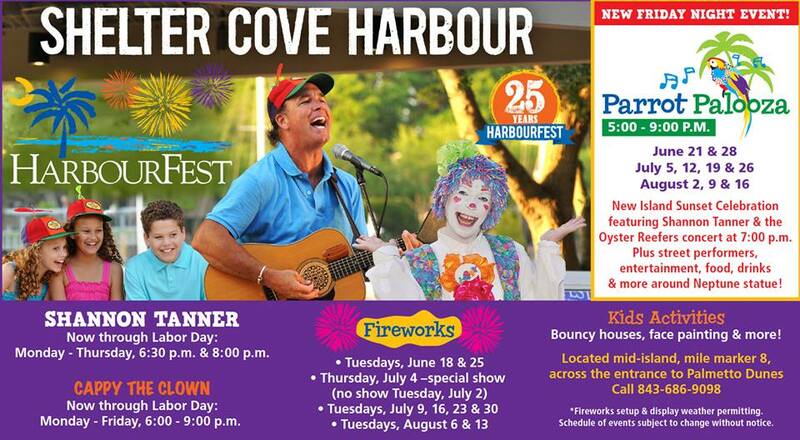 There is so much going on at the Shelter Cove Harbour this summer! Be sure to catch a Shannon Tanner show while you are on the Island, he plays two shows nightly, Monday-Thursday. Parrot Palooza is a brand new show on Friday nights featuring his Jimmy Buffet tribute band and on Tuesdays you can catch the weekly fireworks display! Check out the Bloody Mary Bar at the Black Marlin! — Crabbing and Fishing Camp for Kids!